In Esopus, we explore our place in nature, our place in history, and we discover ourselves. Whether you come to town wearing a suit, slacks, jeans, shorts or spandex – exploration with all the senses awaits. In Esopus, nature abounds in many forms. As an agricultural town, wineries sell locally produced wine, and farm stands offer freshly picked fruits and vegetables, baked goods and hot cider, and local crafts. For those who prefer to go one step fresher, you can pick-your-own apples, pumpkins, cherries and strawberries. Native Americans called this area “esepu” meaning “high banks.” This gently sloped land with banks high above the season-moderating Hudson River, and a tall ridgeline stunting the prevailing westerly winds, is ideal for a variety of produce. High on that ridge is Slabsides, the cabin of John Burroughs – famed naturalist and journalist of John Muir’s era… and celery farmer. Looking south from the Esopus Meadows Lighthouse, the Hudson River shoreline has not changed in a hundred years. 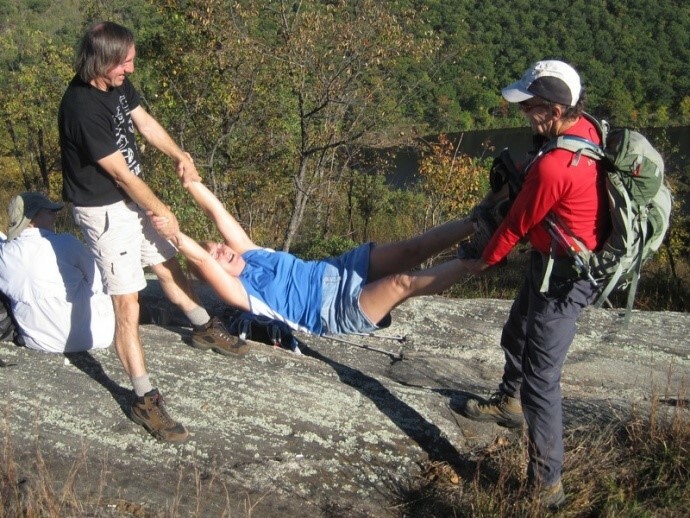 Scenic Hudson and other preservation organizations have protected our precious rustic land and have provided accessible trails ranging from Sunday strolls to rigorous hikes. Nature preserves include the Black Creek Preserve and Environmental Center, Esopus Meadow Forest Preserve, and Shaupeneak Ridge featuring Louisa Pond. 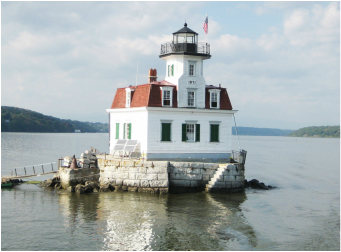 The Esopus shoreline, whether viewed via the 2-mile drive along scenic River Road, or a 3-hour narrated cruise on the Rip Van Winkle sailing out of Rondout Creek, or a visit to the Esopus Lighthouse itself, you are immersed in the revitalizing atmosphere of the Hudson. And there are traditional town parks: Freer Park includes a pavilion, a playground, and overlooks the Hudson River; Ross Park offers a pavilion, a playground, and ball fields. Esopus is mostly bordered by water: the Hudson River to the east, the Rondout Creek to the north, and the Wallkill River to the west. At Sleightsburg Park on the Rondout, dock fishing is available as well as a public boat launch. Following the creek westward through quiet Creek Locks are historic Dutch houses from the very century Henry Hudson first discovered this river valley, and remnants of the Delaware & Hudson Canal – quiet testimony to the early industrial development of this region. The Rondout Creek is the terminus of the Wallkill River whose source is a hundred miles away in New Jersey. Spanning the Wallkill River is the famed Perrine’s Bridge: a wooden covered bridge built in 1835 – the oldest in New York. In the hamlet of Rifton, the solitude of the Wallkill provides a country day of fishing. A packed-dirt rail trail along the Wallkill offers 25 miles of flat bicycling through the woods without automobile traffic. And the gentle current of the Wallkill River offers leisurely canoeing and kayaking – except after heavy rains. Rifton, too, was home to Isabella Baumfree – the abolitionist and suffragist known as Sojourner Truth. Founded in 1811, Esopus is historically a port town. The town center, which boasts the environmentally designed town hall, is the village of Port Ewen. That marine heritage is captured in the Klyne Esopus Museum, the historic Rondout Creek area of downtown Kingston, and the many active marinas with moorings in the hamlet of Connelly. Hudson River heritage is also evident in religious expression: the Shrine of Our Lady of the Hudson hosts the bluestone statue sculpted by Thomas Penning in 1952 with funds raised by local boatmen and towing companies. It is the sole Madonna statue cradling a tugboat. Religious institutions line the shores of the Hudson River – guardians of our earth and our souls. Mount Saint Alphonsus, a retreat center, offers nature and spiritual programs to the public and houses a bookstore; its Romanesque chapel holds the Pieta from the 1939 World’s Fair and many other life-sized religious sculptures dating from the Renaissance to the Industrial Revolution; its halls are lined with replicas of Hudson River School art. Holy Cross Monastery has a bookstore open to the public as well as evening vespers and retreats. The Marist Brothers have an active summer program for youth which includes a team-building rope course. Ascension Church has prayerful images in Tiffany stained glass. The Broderhof, originally religious refugees of WW II Germany, is a self-sustaining Christian community. And the Saint Cabrini Home (our very own Mother Frances Xavier Cabrini was the very first American citizen to be canonized) has offered more than a century of service to thousands of orphans, the elderly, and special services for youth. Just off Route 9W (also known as Broadway) – the main thoroughfare through Esopus – is the Esopus Library which offers a variety of programs including the Ulster County Photo Club, lectures such as The Hudson River School, and exhibits artwork of local artists. Along this main route are many fine restaurants. The south end of 9W offers excellent, affordable lodging. Traveling north, through Port Ewen with vistas of the Catskill Mountains looming in the distance, is the bridge over the Rondout Creek – one of nine sites in Esopus on the National Register of Historic Places – leading to Kingston’s downtown maritime center. In all seasons, Esopus offers a welcome visit to all ages. “Afoot and lighthearted I take to the open road...” Walt Whitman begins Song of the Open Road. So, too, on a sunny Saturday in October do a dozen Appalachian Mountain Club hikers begin their 9-mile trek: ready to walk and in particularly good humor on this archetypical autumn day. In total, this hike includes 7 trails, 6 bridges, 5 bathrooms, 4 lakes, 3 mountains, 2 forts, and 1 zoo – and 2,400 feet of elevation gain. Testimony that we sensed a good hike: one-third of the participants are leaders with 7-year hike leader Susan Pollak guiding the way and prolific hike leader Art Almeida as sweep. And for this day, we pledge to share of ourselves; to travel this path of history, nature and literature; and to stick by each other – nature lovers one and all. This is also the location of Fort Clinton; we discover only remnants of its foundation. We pass beneath the Bear Mountain Bridge which was the first span across the Hudson River in 1924, and while it no longer holds the record as the world’s longest suspension bridge, it continues to be the longest bridge crossing along the entire Appalachian Trail. 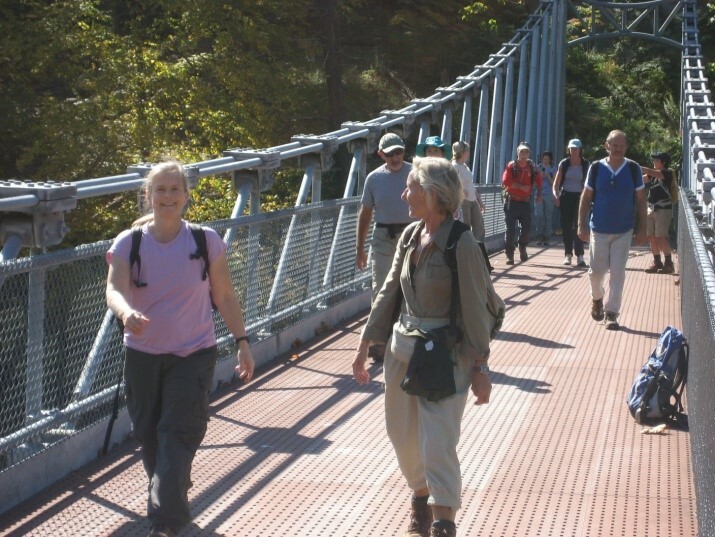 After strolling across the most sturdy of all footbridges (see photo), our group inspects Fort Montgomery – replete with museum, maps, and even a movie on the battle fought here featuring the heroics of Anthony Wayne and patriots. Popolopen Torne is our first major climb of the day, and we are rewarded with a memorial cairn built by the cadets of the nearby U.S. Military Academy at West Point, and a Hudson River Valley panorama. Here with a 360 degree perspective, I see the words of Whitman: “I inhale great draughts of space; the east and the west are mine, and the north and the south are mine.” Here, I understand his words: “From this hour I ordain myself loos'd of limits and imaginary lines.” for atop Popolopen are absent paved highways with their double yellow lines, the bottom-line of the workday, the early morning punch-clock line, the dotted line of the co-op agreement, and all other contracts and social constructs. The trail follows scenic Popolopen Creek which requires several footbridge crossings, and leads to an idyllic lunch respite at Queensboro Lake. From there, we soon reach Turkey Hill Lake signaling we are in the homestretch, and begin our ascent up Long Mountain.. The final trail junction is the 347-mile Long Path – extending from Fort Lee to Albany – which was championed by Raymond Torrey: visionary of the Long Path, author of the New York Evening Post columns The Long Brown Path and also Outings, and founding member of the NY-NJ Trail Conference. A memorial was etched into the rock here atop Long Mountain – his favorite viewpoint in all of Harriman State Park. Here at the Torrey Memorial, terminus of our 9-mile trek, a surprise awaits us – ice cream! Susan had managed to stow several cartons of the Turkey Hill brand on ice before our hike in order to greet us upon completion of our journey. In celebration, we initiate a new tradition: “leader tossing” featuring first victim Hallie Wolfe (see attached photograph). Often when I read about an event in the Poughkeepsie Journal, I am disappointed that it is in the past tense and I have lost my opportunity to participate. If imitation is the finest form of flattery, then Susan Pollak shall be delighted that I am reprising her route on August 10, which I entitle 7-6-5-4-3-2-1. And I promise it shall be: The Best Hike Ever!